Intended for use in an automotive EGR valve, this spring was made from 0.038" Stainless Steel Type 17-7PH wire, and required a load tolerance of less than +/- 0.2 N at the installed length. When the spring rate was taken in to consideration, the maximum available free length variation was +/- 0.35 mm (+/- 0.014"). However, the customer also required a minimum of 5 sigma for the process variation, which reduced the maximum available free length variation to +/- 0.2 mm (+/-0.008"). Additionally, the customer had a zero PPM policy for components. Maverick Spring came up with a solution to work around the tight tolerances and high raw material costs, through focusing on raw material, controlled manufacturing, precision end grinding, and 100 percent load testing and sorting. Maverick Spring Makers sourced high quality precision spring wire, and it was discovered that Nickel Coated spring wire led to fewer coiling problems. The higher cost of Nickel Coated material was more than offset by the savings found in reduced variation and scrap. In focusing on controlled manufacturing, Maverick Spring began with the coiling process. SPC evidence allowed Maverick Spring Makers to determine the optimum coiling speed to minimize scrap. Higher coiling speeds are certainly possible for many other spring designs, and parts collection systems allow for lights-out manufacturing to reduce labor costs. 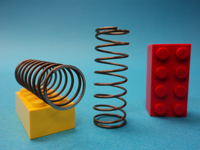 Maverick Spring uses automatic length control for all Compression Spring coiling. The non-contact probe measures the length of each and every spring after coiling, before cutoff. The center-seeking process adjusts the pitch control system on the coiling machine to reduce the total length variation over the production run. In this case, the length control system was set to a limit of +/- 0.25 mm (~ +/- 0.010"). The next process Maverick Spring undertook was grinding. 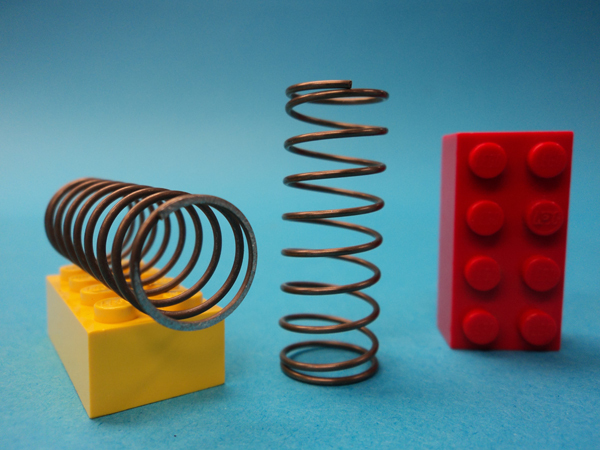 After coiling, the springs' ends are ground to accomplish three things: The solid height of the spring is reduced, the load bearing face of the spring ends is increased (often to 300 degrees or more), and the overall free length variation is improved. As a general rule, the stiffer the Compression Spring, the more free length variation can be improved by end grinding. After grinding, this spring was 100% load tested and sorted. A vibratory bowl detangle system fed an inline vibratory conveyor, which loaded the index plate by way of the escapement system. Each spring was compressed 3 times, to solid height, to remove any permanent set; then tested at both the installed length and the working length. The springs were automatically sorted into pass/fail/rework categories. As the raw material costs are quite high for this spring, the rework category was quite useful.